Imagine a scenario in which ridiculous characters bumble through a series of hilarious coincidences and an equal number of snafus, all in the name of love, marriage and a big business deal. That’s the main idea in Joy in the Morning, the first of three short novels included in Just Enough Jeeves, a great introduction to P.G. 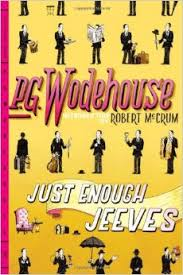 Wodehouse’s famous characters, a twenty-something Bertie Wooster and his manservant Jeeves. In this story, Bertie and Jeeves leave London and head for the quiet hamlet of Steeple Bumpleigh. To anyone wishing to escape a hectic metropolis, Steeple Bumpleigh sounds great. Bertie describes it as located “in the midst of smiling fields and leafy woods, hard by a willow-fringed river.” It’s a place where “you couldn’t have thrown a brick in it without hitting a honeysuckle-covered cottage or beaning an apple-cheeked villager.” Steeple Bumpleigh is also the place, however, where Bertie’s domineering Aunt Agatha and her fearsome second husband, Uncle Percy live. And nothing good can come of meeting up with them. Uncle Percy, a shipping magnate, seeking wise counsel, enlisted Jeeves to come up with a scheme for Percy to meet in secret and seal a big business deal with a wealthy American shipping tycoon. What better place to meet than the Wee Nooke, temporary country cottage to Bertie Wooster? It takes some convincing to get Bertie to agree, but Bertie is nothing if not a good sport and the promise of a fancy dress ball is an extra bonus. Add to the mix the ever-changing romantic ties between Bertie, his ex-fiancée Florence Craye, and her current betrothed, Stilton Cheeswright and things get a little complicated. Florence is Uncle Percy’s daughter from his first marriage and Bertie had narrowly escaped her clutches only months earlier. If that wasn’t enough to cause some hilarious disasters, throw in twenty-year-old Zenobia (Nobby) Hopwood, Percy’s ward, who is madly in love with a famous writer, Boko Fittleworth. Nobby needs Percy’s approval to tie the knot, but Percy has vetoed a wedding. In steps Bertie to put in a good word and you can only guess where that will lead. I loved this clever story! Joy in the Morning is pure entertainment and a great escape into the frivolous upper crust world of a lovable good chap who gets himself into the wildest predicaments. As in all of Wodehouse’s books, everyone counts on the ever-wise Jeeves for a solution and he does not disappoint. It is written in a light and fun-loving mood and I read the whole thing with a big smile on my face. Check it out and you’ll know what I mean! Click here to learn more about P.G. Wodehouse. Check out my review of Very Good, Jeeves. I haven’t but I’m sure it’s hilarious. Thanks for visiting, Mom Goes On! This seems like a good read! I have added this to my list. I’ve never read any P G Wodehouse. This sounds like it might be a good place to start!